Is the Premier League license vital? The English Premier League has never been licensed in a PES title. Down the years, Konami have been limited to licensing just two clubs from the English top flight each year. Arsenal, Chelsea, Liverpool, Manchester United, Newcastle and Tottenham have all been licensed in the Pro Evolution Soccer series so far. Generally, unlike South America, Asia and the majority of Europe, the UK market is FIFA-owned territory. Is this because different people from different regions and cultures prefer different things, or is it more to do with the fact that the Premier League has never been licensed in the PES series? Would the UK market still be dominated by FIFA, if somehow, Konami were able to take full control and gain the full Premier League license from EA - or would FIFA fans stay loyal and continue to support EA, playing a FIFA title with an unlicensed Premier League? From a genuinely unbiased point of view, I like to think that, each year, everyone gives both games a chance. On top of that, I also hope that everyone picks their game based on the more important aspects, such as gameplay and gamemodes, rather than being sucked in by pretty visuals, shiny licensing and glamorous marketing campaigns. Of course, this is all hypothetical. Ultimately, I will admit that these scenarios are very unlikely to happen. For any games developer, you're always going to struggle against EA, if you challenge them to a 'who is willing to spend more money' battle. As a long-time PES fan, I've always tried to show the light to my FIFA-playing friends, most of which have never even played PES - but somehow, they still think it's fair to label PES 2012 as "sh*t". When my mates come round, I always tend to offer them a game on PES 2012. Some of them want to play FIFA, but sadly for them, FIFA 09 is the best I can offer them - one of my friends lent me it a few years back, and since, it's been gathering dust! PES fan or not, they always give it a go. Funnily enough, after about 4 or 5 games on PES 2012, they all tend to admit that they're impressed. The majority usually state that "despite it's flaws, it's a really, really fun game that's just so easy to pick up and play" - or something along those lines anyway. One or two of them have actually gone out and bought PES 2012 themselves. Sadly, there is no commission for me. But I'll always remain upbeat, knowing that I've "converted" a few more of my friends to PES, just by sitting them down and showing what Konami have put out this year. At the end of the day, some will always play the game that boasts the most licensing. It's a harsh reality that Konami have had to accept - but like any innovative games developer, they found a solution, with the ingenious implementation of the option file - as well as the fantastic edit mode to match. But for some, this isn't enough. As well as the people who personally, do prefer playing FIFA, you'll have the ones who will immediately write off PES, just because of it's lack of licensing - although promisingly, the absence of licenses is getting smaller and smaller, year by year. I recently met someone who said "PES is sh*t, because it doesn't have real names and that". Standing there perplexed, I was unable to say anything. If that's the attitude of some people, I don't want to waste my time, telling them why they should give PES a chance. Ultimately, it's a cruel reality for Konami. Some licenses are blocked, and dauntingly, it appears that they'll never get the chance to license particular teams and leagues. And to really rub the salt into the wounds, some people actually blame Konami for not owning these blocked licenses. 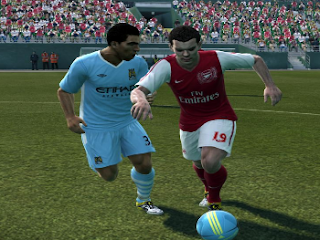 PES or FIFA, everyone should pick their game, based on their own personal preferences. Am I being too harsh here, or is licensing in a football game just as important as the actual gameplay and gamemodes themselves? Should the absence of the Premier League license stop PES from outselling FIFA? For me, the answer is no.